Direct Moves estate agents are pleased to offer this substantial DETACHED FIVE BEDROOM family home which is located within RODWELL, WEYMOUTH . It offers large living space comprising of lounge, diner, kitchen with walk in larder and utility, downstairs cloakroom, sun room, five bedrooms, family bathroom and a wrap around garden. Benefiting from a DOUBLE GARAGE and off road parking for two cars high demand is expected so please call DIRECT MOVES on 01305 778500 to arrange a viewing. Main Hall – Front aspect double glazed window, wall mounted radiator, power points, telephone point, coat rail, stairs leading to first floor, door to rear hallway, door to Reception and Dining Room. Reception – 12’10 x 16’1 (3.91m x 4.90m) – Stone fire surround, power points, wall mounted radiator, side aspect double glazed window, glazed sliding doors. Sun Room – 12’11 x 7’10 (3.94m x 2.39m) – Providing front aspect double glazed sliding doors to garden, side aspect double glazed window, further window into entrance porch, wall mounted radiator. 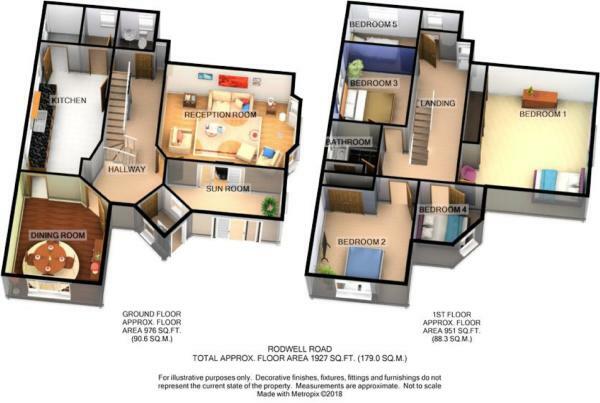 Kitchen – 19’0 x 10’10 max (5.79m x 3.30m max) – Two side aspect double glazed windows, door to rear hallway, a range of units, space for cooker, dish washer, fridge & fridge freezer. Door to larder, being shelved and housing the gas and electric meters, power points, wall mounted radiator. Utility – Comprising of work tops, space and plumbing for washing machine, power points, rear aspect double glazed window. Wet Room – Rear aspect double glazed obscured glass window, pedestal wash hand basin, wall mounted towel rail, wall mounted shower with shower curtain. Bedroom 3 – 8’0 x 10’10 (2.44m x 3.30m) – Side aspect double glazed window, wall mounted radiator, central ceiling light, power points, partially tiled.